I forgot to tell you what it was like arriving to Forest Camp on our first day of hiking. Somehow I was alone. I’m not sure how that happened. With 6 other hikers and 71 supporters of our party (not to mention all the other groups on the mountain) it was rare to be out of earshot of any other being. But I was alone, and loving it. Every glance afforded me the vision of a plant I had never seen before, or a view into the sloping distance with the light falling into the trees. This is my idea of heaven: enjoying what is wild without any responsibility to record or share it. As I attacked the tall steps of the steep trail, laid out in a tangle of intersecting tree roots that I always think of as “Nature’s Staircase,” I wondered how far until camp. I looked up the trail but could not see a ridge through the trees. My GPS wasn’t working due to the dense forest, and I couldn’t tell how far I had to walk. That’s when I heard the sound. What was that buzzing? At first I thought it was an insect or an animal. It grew to a murmur. As I continued climbing the steep root-steps of the trail, the noise grew louder. Soon, as in a concert hall, I started isolating some of the different elements of it. There, I could here clanging of pots. There, I could here the thwap of fabric as tents were unrolled and straightened. There, the lilting voices exchanging Kiswahili phrases. It was camp up ahead. I couldn’t tell how far, but I could hear it. When I crested the ridge, each sound became an image. The camp was narrow and long, perched on a ridge bordered by tall trees. It was a tidy society, working in time without me, but waiting for me to get there. There were so many groups I couldn’t find mine. So I wandered for a while. I met a young newlywed couple from Napa who were playing cards at a small table. 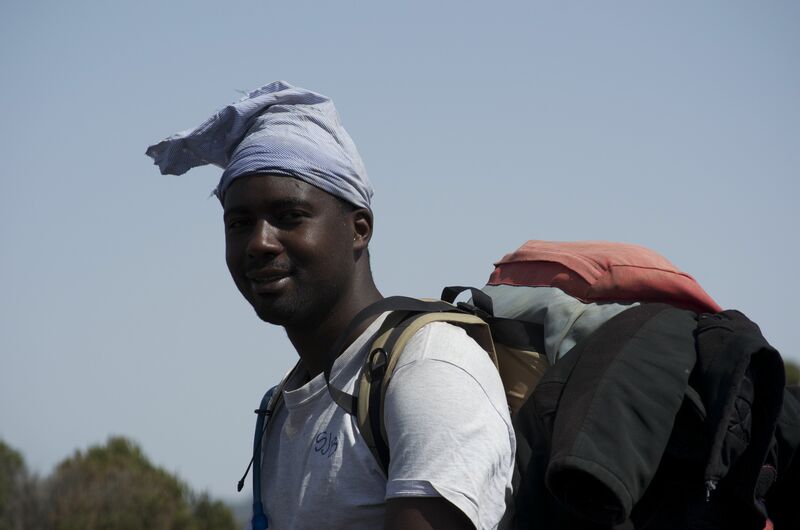 Porters from other groups high-fived me and said, “good job.” Finally I saw Kepha, our cameraman, and he pointed me towards the very last campsite, which is where we made our home. Waking in Forest Camp on Day 2 of our hike had some similarities to approaching it from the trail. The music of camp started slowly, like an orchestra warming up. I could hear our cooks clanging pots as they put on water for coffee. I heard the porters in their tent slowly rising from their sleeping bags. I looked over at John, “How’d you sleep?” and then we were blinking and yawning with the rest of camp. I did not sleep well. I didn’t have my camp legs yet. That’s when Stanley came to our tent with coffee and a huge smile. It was our sign that we had 2 hours to eat, pack, and hit the trail again. Our breakfast of oatmeal, eggs, fruit, and toast tasted really wonderful, and I was wondering when I was going to lose my appetite from the altitude, as most reports promised I would do. For now, I was fine. And we started hiking through the forest. Hiking through the last bits of rain forest. When we started walking it was crowded. 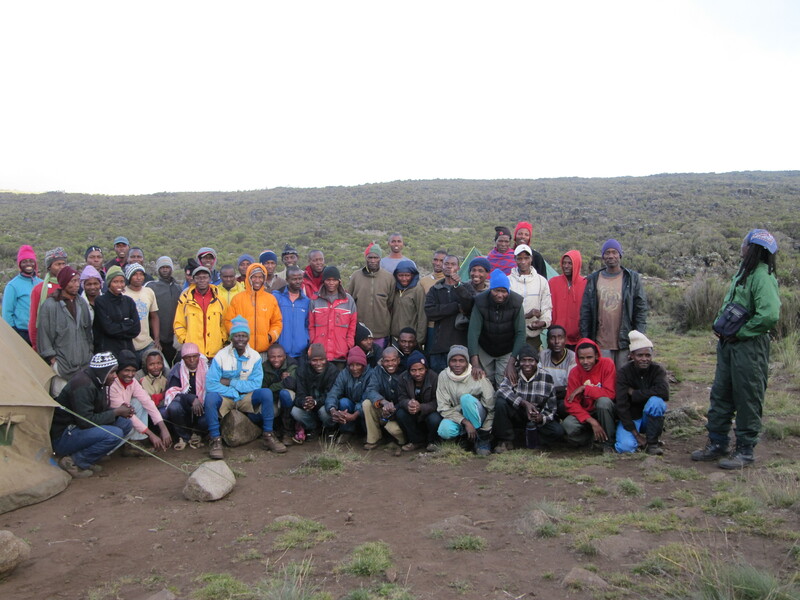 Not just with porters, but with 2 huge groups of over 25 hikers each. It was such a contrast to my solitary entry to camp the previous day that I got quite grumpy. I spent about 35 minutes staring at the feminine rump and stumpy legs of a short, middle-aged Frenchman. He and his buddy were having a heated exchange over office politics: I noticed that they looked only at each other and not at the landscape. I craved the solitude of the day before. 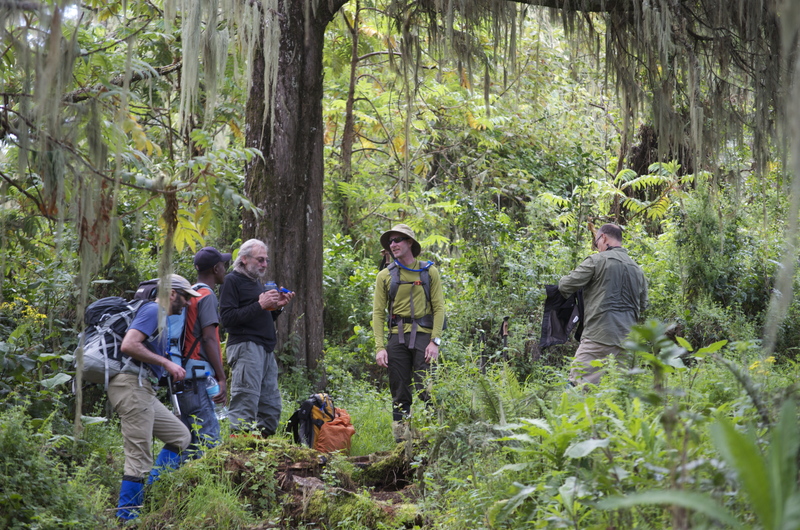 Soon one of the massive groups took a break on the trail (cigarettes included) so we were able to shoot around them. The trail broke out of the rainforest and into the heather zone, which also helped relieve some of my feelings of claustrophobia. As we continued to hike towards our lunch spot, I fell in line with our guide Nuru, who enjoyed teaching me several Swahili phrases. I was getting hungry and asked him how far until our lunch spot. “Oh, we’re 75% there,” he would say. Then in a few more steps, “Oh, 78% there.” Soon we broke over a ridge and saw our cook Manase, the other camp cooks, and our lunch table dressed smartly among the bushes. We sat down and enjoyed a beautiful meal of fruit & veg, soup, boiled eggs, cheese, tea, coffee, and toasted cashews. As we climbed away from our lunch, we were surprised to maneuver around one of the two massive groups who were traveling with cut-rate outfitters. They littered the rocks with their gear and their bodies, and with their tiny Tupperware containers full of dry cheese sandwiches. As we tried to pass, we had to dodge as they traded paltry contents from their lunches back and forth like grade schoolers. Our group wondered out loud why these trekkers were having their lunch on the trail instead of on the ridge, and we came to the conclusion that their guides probably didn’t want them to see our luxurious table, chairs, and meal. We continued climbing up. It was a little steep and I got a little warm. I shed as many layers as I could. Now I was hiking with Nicksoni, another of our 4 guides (we laughed later that all 4 guides’ names started in N: Nuru, Neema, Nicksoni, and Nile). Nicksoni told me he really wanted to go to America and when I asked him where he said “California” because he’s a Laker’s fan. He talked to me about his two sons, Chris and Rich, and his wife. I asked how they met and he said they were neighbors. Nicksoni wanted to know what kind of music I liked, and we exchanged names of favorite bands. And we continued marching up, up, up. He taught me to say it in Swahili: juu, juu, juu. We were going to use that a lot. The views were spectacular. Nicksoni laughed at my manic self. What is it about a panoramic view that makes me feel so happy? But we hadn’t yet had the best one. 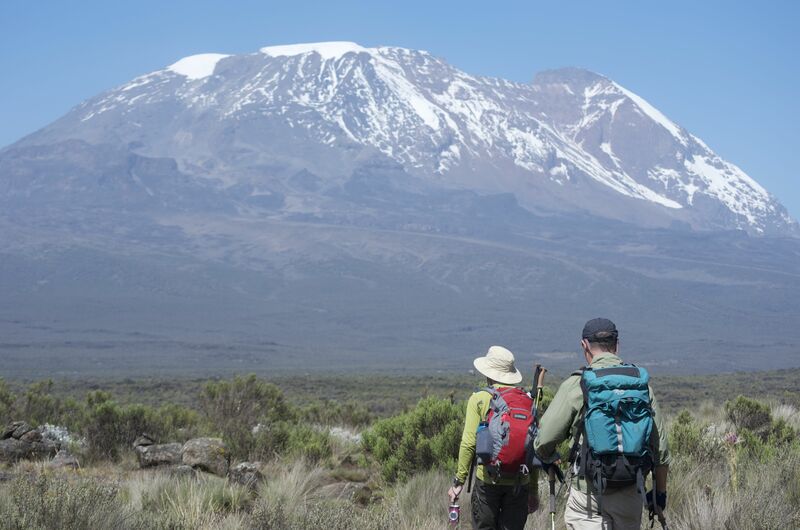 We had yet to see the peak of Kilimanjaro, had started to doubt it even existed. Nicksoni told me we were getting close to a ridge where the Shira Plateau would open up before us. We started to see porters pulled off to the sides on their cell phones. We saw Nuru on his phone, talking with his pregnant wife. “Do you need to call home?” I asked Nicksoni. He smiled and shook his head no. Then, with very little warning, we turned the corner and saw Kibo. Really!!!!???? Just like that! I had seen so many pictures and had longed to see even a glimpse of that gleaming snowy peak. And here it was! Day 2! And now we would spend the rest of the hike knowing just where we were headed. We turned the corner and saw Kibo. Massive photography spurts ensued. It lacked grace. Pictures of clients & guides. Pictures of couples. Pictures of the whole group. Friends. Individuals. Pictures with the Nikon, the iPhone, the Canon, the Sony. Pictures with Kapanya, Nuru, Neema, Nicksoni. I got a spot of cell service and texted a picture to Twitter and Facebook. We were giddy. We were silly. And we had a long way to go. 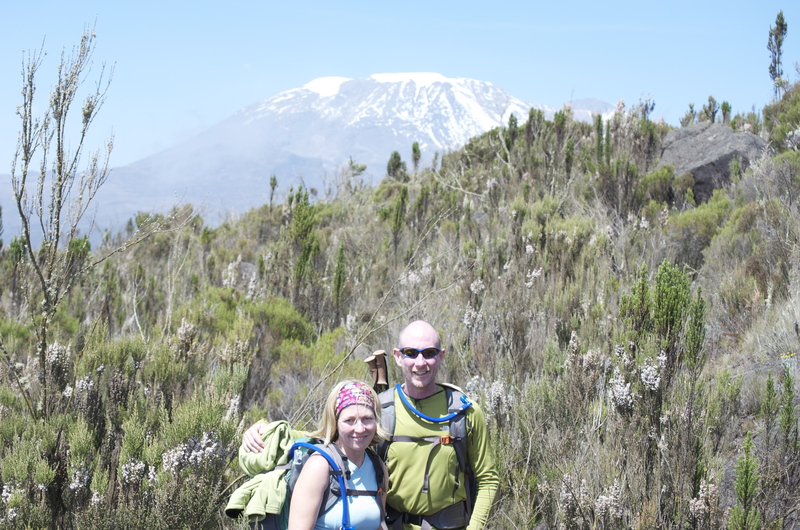 Before leaving the states I had seen a picture of hikers in the heather, with Kibo in the background. I just wanted that shot. So as we walked on to our camp for the night I took about 100 pictures trying to capture that look. I had to force myself to put the camera down and look around and breathe. As we got closer we could see Shira 1 Camp. This would be our most crowded camp of the 7. The 2 massive groups were set up with their triple-bowed mess tents. The Napa couple were playing hackey-sack with their guides. We signed the ledger and headed to unpack for the second time of the trek. We pulled our chairs out of the mess tent and sat for a while contemplating Kibo. We took more pictures than seems humanly possible. Kapanya took pictures too, pleased with the clear weather we were lucky to enjoy. He said it was because we all brought the umbrellas he had required (and that we had balked at). I was feeling worried about the rest of the trek. The summit looked so far away, and so high up. I said this out loud: “Kapanya, Kibo is so far away.” He smiled and shook his head and said to me, “But Trish, you came from America.” Kapanya, infinitely wise. In planning for the trip, I had imagined Day 2 as being one of the easier days of the trek since it remained well under my lifetime elevation cap of 14k feet. I guess many of my anxieties about the trip came from wondering how I would handle elevation above both of my high points (highest point achieved 14k and highest sleeping point 11k, both on the Inca Trail in Peru). I figured that in Africa I’d be fine until I got above those points, and Day 2 topped out at only 11,844. But Day 2 ended up being one of my harder days on the trail due to the crowds. I don’t like hiking with my face in someone else’s backpack. I think the hard night’s sleep was a problem too. Also, I think I was nervous before we saw Kibo, and then perhaps more nervous after. We had a wonderful dinner of fruit & veg, tomato soup, and beef stew. Then we curled up in our sleeping bags. I decided to pull out my iPod and let Terry Gross talk me to sleep. The Fresh Air helped, and I was soon snoozing away.